Norfolk, Richmond, Newport News, Roanoke, Virginia, or Washington, D.C. There is daily all-reserved service about every hour during the day. Trains generally run along the Northeast Corridor between Boston, Massachusetts, and Washington, D.C., via New York City. Extensions, branches and Shuttle trains provide service to Springfield, Massachusetts, and Richmond, Newport News, Norfolk and Roanoke, Virginia. Northeast Regional trains operating on the lines in Virginia, the New Haven–Springfield Line, and overnight trains 65, 66, and 67 use GE P42DC diesel locomotives and have lower top speeds of 110mph. Because the Virginian segments use freight railroad tracks, these trains are more likely to suffer delays due to congested tracks. Some Northeast Regional trains continue into Virginia, serving Richmond, Norfolk, Newport News, Roanoke, and points in between. These tracks are not electrified and are owned by freight railroads; some segments including tracks through Acca Yard in Richmond have severe speed restrictions. After Amtrak took over intercity passenger service on May 1, 1971, rail service in Virginia was limited to a small number of long-distance trains, where they were often not suited to regional travel. Regional service south to Newport News began on June 14, 1976, when Amtrak ended the Newport News section of the James Whitcomb Riley and the Colonial was added in its place with two daily round trips from Boston to Newport News via Alexandria, Richmond and Williamsburg. The long-standing service has sufficiently high farebox recovery that no subsidy from Virginia is required. Amtrak Northeast Corridor, New Rochelle to Washington, D.C. Some trips diverge at New Haven and turn north to serve Springfield, Massachusetts, operating over the New Haven–Springfield Line owned wholly by Amtrak. The New Haven-Springfield Shuttle provides supplemental service along this line, with timed connections to/from with select Boston-bound Northeast Regional trips. South of Richmond, trains to Newport News use the Peninsula Subdivision. Trains to Norfolk use the North End Subdivision and Norfolk Southern's Norfolk District (ex- Norfolk and Western Railway). Until around 1999 some service to Springfield continued east to Boston, for an alternate Inland Route between New York and Boston. One weekend train stayed on this route until the November 1, 2004, schedule. One train, the Federal ( Twilight Shoreliner until 2004), formerly carried an overnight sleeper between Washington and Boston, giving the corridor 24-hour service; the Federal name (briefly resurrected in 2004) is no longer used, and an ordinary all-coach Northeast Regional runs in its place. The Northeast Regional receives federal funding for its operations between Boston and Washington, D.C. Northeast Regional operations south of Washington are funded by the Commonwealth of Virginia. Operations along the New Haven-to-Springfield Line are funded by the State of Connecticut and the Commonwealth of Massachusetts. Burke Centre, Roanoke, and intermediate stations are used only for service between Alexandria and Roanoke, Virginia. Charlottesville Charlottesville Amtrak: Cardinal, Crescent, Thruway Motorcoach to Richmond, Washington D.C.
Woodbridge, Newport News, and intermediate stations are used only for service between Alexandria and Newport News, Virginia. Woodbridge, Norfolk, and intermediate stations are used only for service between Alexandria and Norfolk, Virginia. ^ a b c "Amtrak FY16 Ridership and Revenue Fact Sheet" (PDF). Amtrak. April 17, 2017. Retrieved October 13, 2017. ^ "Timetables (see Northeast Corridor 1-3)". Amtrak. Retrieved January 13, 2017. ^ "Amtrak Northeast, Mid-Atlantic, and Virginia Service Timetable" (PDF). Amtrak. January 8, 2018. Retrieved January 13, 2017. ^ "The eternal question: New York via train or bus?". Greater Greater Washington. August 3, 2010. Retrieved May 11, 2015. ^ a b "Amtrak - Northeast Regional". TrainWeb. Retrieved April 8, 2018. ^ "A Fond Farewell to the AEM-7". Amtrak. June 20, 2016. ^ "Scanner". Trains. February 1997. ^ "A step back in the Northeast". Trains. August 1999. p. 17. ^ Johnston, Bob (January 2001). "Acela Express begins; NEC schedules revamped". Trains. Vol. 61 no. 1. p. 24. ISSN 0041-0934. ^ "Amtrak to Limit Use of Train Name 'Acela'". Huron Daily Tribune. Associated Press. March 4, 2003. ^ "Form W4–50M–4/7/08 Northeast Corridor: Boston to Virginia Beach" (pdf). Amtrak. April 7, 2008. ^ "Regional Re-Launch Begins Today" (PDF). Amtrak This Week. Amtrak. June 23, 2008 – via Government Attic. ^ "At Least 7 Dead, Over 200 Hurt After Amtrak Train Derails, Rolls on Side in Philadelphia". Philadelphia, PA: WPVI-TV. May 12, 2015. Retrieved May 13, 2015. ^ "Did something strike Amtrak train before crash?". ABC7 Chicago. May 15, 2015. ^ "TransDominion Express Status Update Study" (PDF). Virginia Department of Rail and Public Transportation. January 3, 2007. ^ "NEW WEBSITE FOR AMTRAK TRAVELERS IN VIRGINIA – AMTRAKVIRGINIA.COM" (PDF) (Press release). Amtrak. September 24, 2009. Archived from the original (PDF) on October 7, 2016. ^ "Northeast Corridor Timetable 3" (PDF). Amtrak. October 1, 2009. Retrieved April 8, 2018. ^ Reed, Ray (December 16, 2009). "Amtrak's Lynchburg-Washington line beats projections". The News & Advance. Retrieved December 17, 2009 – via The Committee to Advance The TransDominion Express. 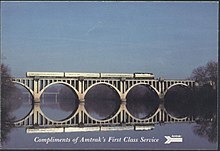 ^ "Amtrak Virginia Introduces Additional Service Between Richmond, VA and Washington, DC". ETB Travel News. July 14, 2010. Retrieved April 8, 2018. ^ "Governor McDonnell Announces Amtrak Virginia to Norfolk to Start December 12". Hampton Roads Chamber of Commerce. August 30, 2012. Retrieved April 8, 2018. ^ "Virginia Announces Additional Amtrak Service to Norfolk Beginning March 4th" (Press release). Virginia Department of Rail and Public Transportation. January 18, 2019. ^ "Newport News & Norfolk Schedule Optimization" (PDF). Virginia Department of Rail and Public Transportation. January 10, 2019. ^ Marrano, Gene (August 20, 2013). "Passenger Rail Is Coming To Roanoke Says Governor McDonnell". The Roanoke Star. Retrieved June 20, 2018. ^ Sturgeon, Jeff (December 6, 2016). "State hunts for contractor to build Roanoke Amtrak platform". Roanoke Times. Retrieved April 8, 2018. ^ Wickline, Alison (October 30, 2017). "Roanoke celebrates inaugural Amtrak ride". WSLS. ^ "Reserved Coach Class Seat". Amtrak. Retrieved April 8, 2018. ^ "Northeast Regional Train". Amtrak. Retrieved April 8, 2018. ^ "Travel Guode to Train Fares". Amtrak. Retrieved April 8, 2018. ^ "Amtrak National Facts". Amtrak. Retrieved April 8, 2018. ^ "PVTA System Map". Pioneer Valley Transit Authority. Retrieved October 29, 2018. ^ "Springfield Union Station (SPG)". Hartford Line. Retrieved October 31, 2018. ^ "Windsor Locks (WNL)". Hartford Line. Retrieved October 31, 2018. ^ "Windsor (WND)". Hartford Line. Retrieved October 31, 2018. ^ "Hartford Union Station (HFD)". Hartford Line. Retrieved October 31, 2018. ^ "Berlin". Hartford Line. Retrieved October 31, 2018. ^ "Meriden". Hartford Line. Retrieved October 31, 2018. ^ "Wallingford". Hartford Line. Retrieved October 31, 2018. ^ "New Haven State Street". Hartford Line. Retrieved October 31, 2018. ^ "New Haven Union Station (NHV)". Hartford Line. Retrieved October 31, 2018.